Oasis has been converted into 4 luxury barns making it the ideal get-away for friends or family groups. Each barn is independent, for those that need their own space, yet we have a large (1,000 sq ft) games function/room to allow social gatherings. All bedrooms can be configured with super-king or twin beds to best suit your needs. The barns can be booked as a group or individually for weekly and short breaks all year round. For each bedroom there is a bathroom. All of the accommodation is single storey (ideal for young and old alike). Underfloor heating throughout keeps you warm on those winter evenings and luxury Egyptian cotton bedding and towels are provided. 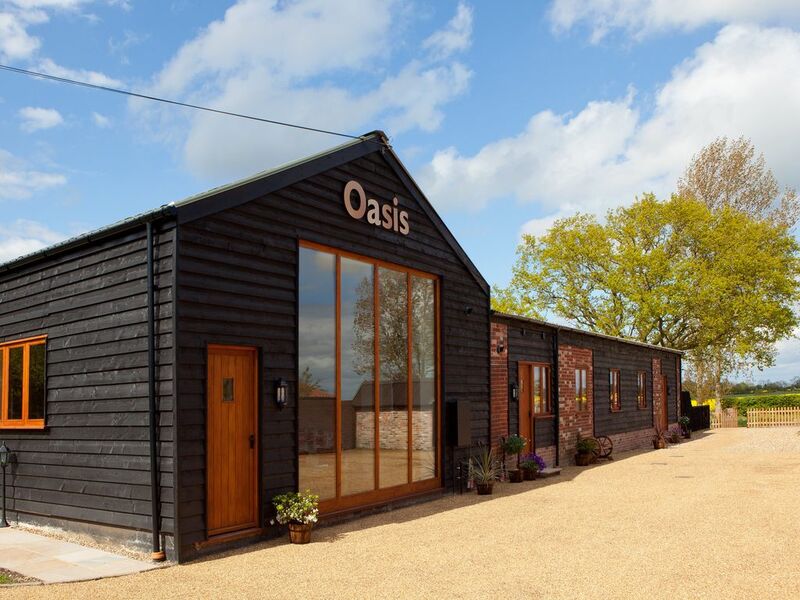 The large communal function/games room (Oasis barn) provides sofas for relaxation, a dining table with 14 seats, as well as games and books for your use, again with underfloor heating. This is an ideal area for the social gathering of a group. Each barn is finished to an exceptionally high standard with the following features in the living space: Leather sofa, flat screen TV/DVD and USB charging sockets. The adjoining kitchen/dining areas are fully equipped having a fitted 'shaker' style kitchen with fully integrated oven, hob, fridge, washer/dryer and dishwasher. In addition there is a Nespresso coffee machine, microwave, toaster and iron. The dining areas have solid oak table and chairs. Everyone has access to the pond area and gardens, which provide a large patio area with table and chairs. With views over the open fields and pond you will find the ideal setting for sipping your Champagne. Three of the barns also have a private garden with Rattan garden furniture to enjoy dining al-fresco. Situated between Halesworth and Bungay in the Waveney valley are a handful of small villages known locally as 'The Saints'. It is here that All Saints South Elmham lies with its wealth of open countryside. All Saints South Elmham is extremely popular with cyclists with a maze of narrow country lanes. South of the curiously named St Cross South Elmham stands South Elmham Minster and Hall, a 16th century farmhouse. Just south of the hall are the ruins of South Elmham Minster. In the heart of the Waveney Valley with its idyllic villages and unique market towns, All Saints South Elmham is an unspoilt haven of wildlife, big open skies and a mild dry climate. Situated equal distance from both the pretty market town of Halesworth, famous for its Arts and offering shopping as it used to be and the historic market town of Bungay, All Saints is a splendid location for holiday makers. With tranquil surroundings and spectacular views across the fields we offer an escape from the frantic pace of everyday life. An ideal location for walking, cycling, bird watching and fishing, it is within walking distance of an award winning pub, The Rumburgh Buck, popular with locals and visitors alike and close to St Peter’s and brewery and Valley Farm vineyard. All Saints is centrally located within the Waveney Valley to enjoy boating on the broads at Beccles, frolicking on the beach at Southwold or Aldeburgh, the hustle and bustle of Norwich or the peace and quiet of the countryside and the heritage coastline. All are an easy drive. Whatever your ideal holiday, 'The Saints' offer the perfect base for a luxury break. After 18 months of work the barn opened in August 2015 for it's first customers. The barns have been finished to a high standard to allow you to relax in comfort. 15% late booking discount available. Please check out our reviews. Fridge in each barn plus fridge/freezer in games room. 32" LCD flat screen in each barn. 50" TV in games room. Range of books available in games roNew for 2018om. 3 of the barns have private garden and all have access to a garden space with pond shared between all guests. Girls weekend at fantastic venue! The whole property is absolutely beautiful, very clean and modern. We stayed the weekend for my friends hen do, and enjoyed having the large games room/dining room to have dinner as a group, play games and dance all night! The separate barns are lovely, all with a welcome hamper provided which was such an amazing touch! The amount of detail and effort that has gone into this property is brilliant. Would definitely recommend, and hoping to stay again one day. A fun family holiday in a fantastic place! The Oasis barn is one of the best places we have ever stayed - everything is done to such a high standard and the owners have literally thought of everything - from a beautiful hamper on arrival, fresh milk, eggs and OJ in the fridge and as for the games/family room - amazing!! Thank you Stuart and Joanne for the perfect setting for family fun! We would all highly recommend you! We have just sadly returned home from Oasis barns. Wow they were amazing. The welcome basket and the dogs presents were fab. Can't wait to go back. All Saints is a rural spot in the Waveney valley where you can walk for miles across glorious rural farmland in splendid isolation. We are only 1 mile from a CAMRA award winning pub and an easy drive to the coast at Southwold in one direction or the city of Norwich in the other. The local villages and towns are quintessentially English in an area where time seems to stand still. There is a local brewery (St Peters) 2 miles away and a vineyard (Valley Farm) only 3 miles but we are within 7 miles of 5 breweries and 2 vineyards. 20% late booking discount available. Mon - Fri: 4 nights for the price of 3 (off peak). Please note the price displayed on this website are for All four barns. Please contact us for other rates.